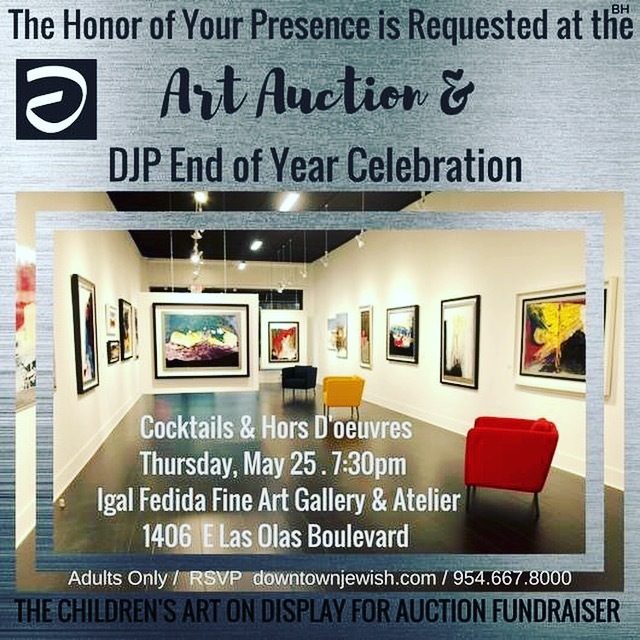 Art pieces made exclusively by the students of the Downtown Jewish Preschool will be exhibited and auctioned off at the Igal Fedida Fine Art Gallery & Atelier on Las Olas Boulevard. This one of a kind event containing Jewish Preschool Art of Fort Lauderdale provides parents with timeless classical pieces to hand down for generations. DJP is the First Progressive Reggio Inspired Preschool in Fort Lauderdale, Florida with an emphasis on child centered and social constructionist environment. The art exhibit is a true synthesis and demonstration of the pedagogy and philosophy behind this innovative and modern school. “We believe in the hundred languages of children and enabling them to express themselves in as many forms and mediums as possible”, says Devorah Kaplan,Director of the Preschool. Last year, the art exhibit was at the Steen Family Education and Event Center. Rabbi Kaplan shares, “Thank G-d, we have grown so much that we needed a bigger and better spot for the evening event! The art is a collection of projects and re-purposed art that the children have created over the year. There will also be individualized art pieces by the kids, that have been inspired by Igals direction and tutelage. We are happy to bring together the community in this wonderful venture!